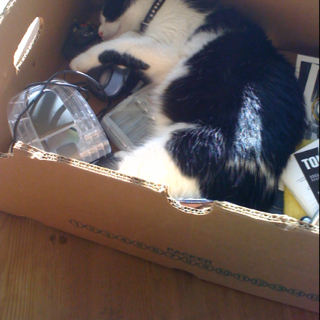 Pauked.com » Cats sleep in the weirdest of places! fourth cat? omg! u’re obsessed with them! btw, finally your blog is back to life! spring time yey! Well, it’s not me, it’s the wife :D But I guess I am too for giving in. Snitch we actually rescued, since she looked to have been abandoned and kept getting pregnant. She was really skinny and when we first got her she kept hiding all the food, turning bowls over, etc, since she didn’t want anyone else to have it. As you can see, shes a tubby one now!